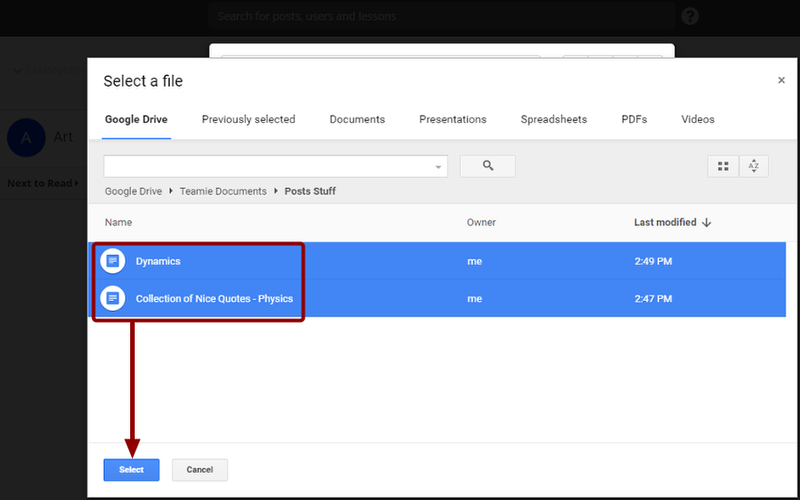 Teamie is integrated with Google Drive which gives you the flexibility to attach Google Documents (such as word document, sheets, pdf's and more) from your Google Drive to posts and assessments very quickly within Teamie. This way, you can share some interesting stuff with others and ask them to collaborate. 1. In the post creation form, click Pick file from Google Drive. 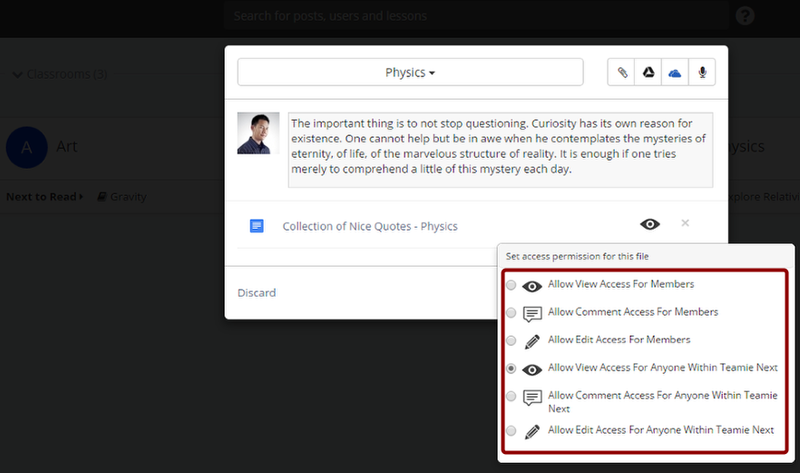 Note: For more information about adding a post, see section, “Adding a thought". 2. Locate the folder where you have created the Google document in your Google Drive, select the file you wish to upload and click Select. Note: If you wish to upload multiple files then locate the folder where you have created the Google documents in your Google Drive, select the files you wish to upload and click Select. 4. You will see the progress of your file upload. 5. To view the file, click the filename. To remove the file, click X. 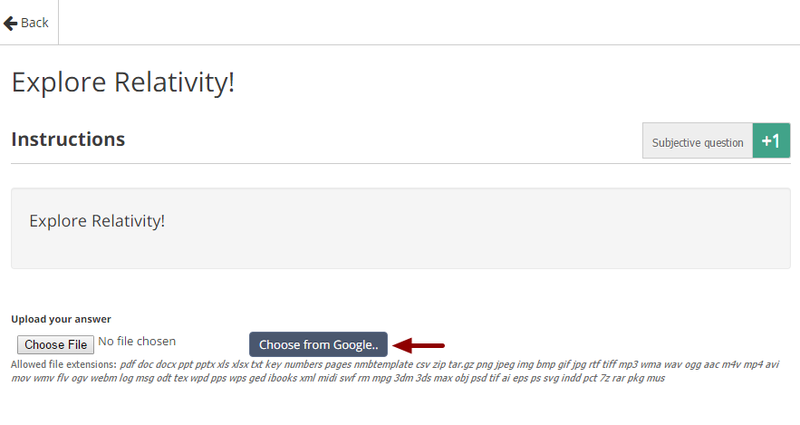 Allow View Access For Members - Users can only view the attached Google document but can’t edit or comment on it. Allow Comment Access For Members - Users can view and add comments, but can’t perform edit action. Allow Edit Access For Members - Users can view, add comments and edit the attached Google document. Allow View Access For Anyone Within Teamie - Anyone with the link to the file can access and view it. Allow Comment Access For Anyone Within Teamie - Anyone with the link to the file can comment on it. Allow Edit Access For Anyone Within Teamie - Anyone with the link to the file can edit it. Note: Above sharing settings can also be enabled for Google Drive documents which are added in Thought, Question post. If you don't see these sharing settings on your site then settings might be in disabled state and can be enabled by contacting your site administrator or Teamie Support. 8. After you've set the access permission, click Post Now to share your post. Note 1: Learners are not allowed to share post with multiple classrooms. Note 2: Learners are also not allowed to share homework/task post. Note 3: You can also schedule a post or create a draft post to post later. 9. The moment you click the Post Now button, post sharing process starts. 10. A message appears confirming that the thought has been posted successfully. You can click on the link given in the notification to view the post. 11. 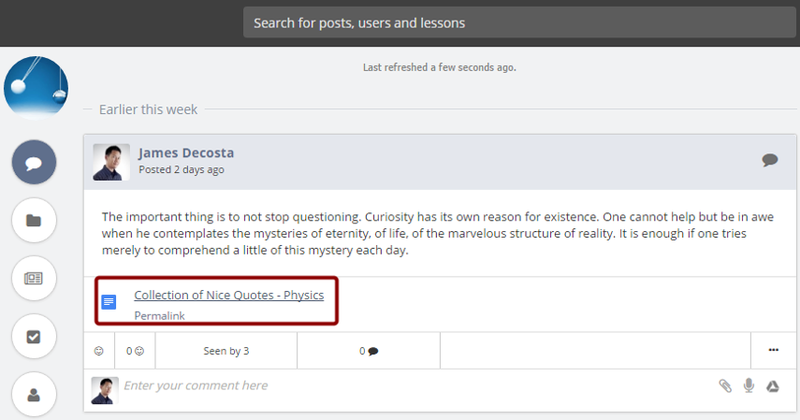 Once the post is shared with the selected classroom, you will see that post on the classfeed. To view the file, click the filename. 12. 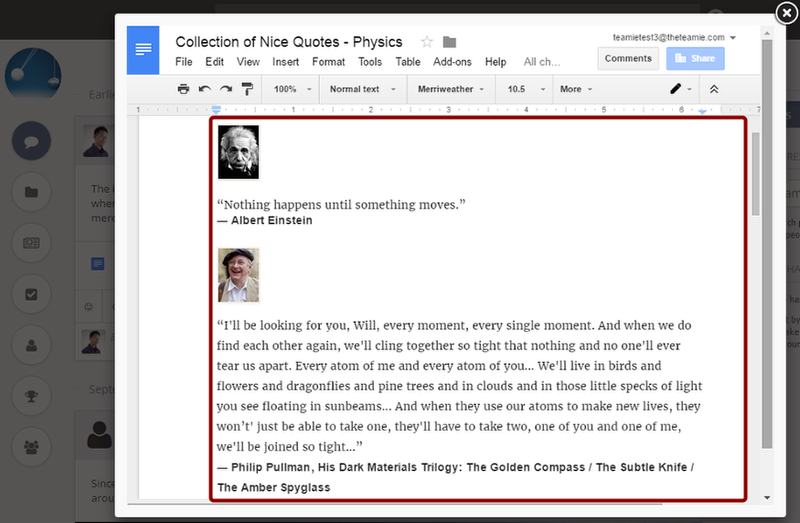 The attached Google document will open in a popover where you can through the document's content. You can also refer to the following video for more information about uploading a Google document in a post. 1. On the Materials page, Click on an assignment to which you wish to make a submission. 3. Locate the folder and select the file you wish to upload. Then click Select. 4. Selected Google document will be uploaded shortly. 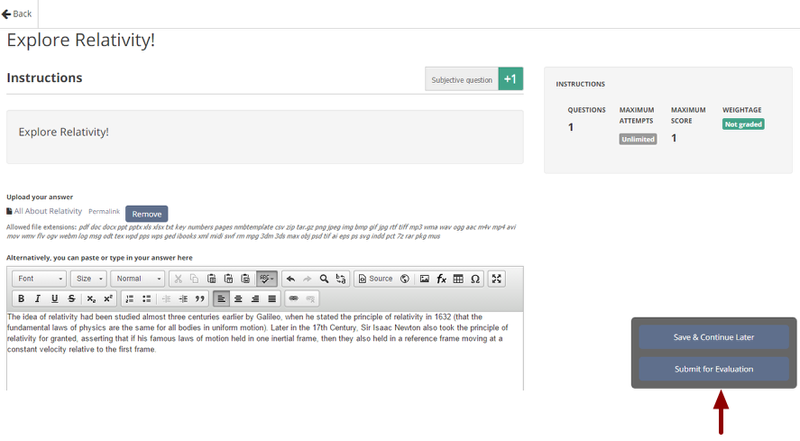 You can also type out the text in rich text editor while making the submission. Note: This is optional and depends on the assignment settings, whether instructor has allowed textual submission or not. 6. A confirmation message appears to inform you that you have uploaded a document. Click Yes to confirm or Cancel to make any change in your submission and re-initiate the submission process. 7. A message appears confirming that you have successfully made a submission. Click View Submission to view the submission you have made. 8. The submitted document will open in the same window. Click Back to go to the Materials page. Note: Repeat the same steps for making a Google document submission to open-ended questions in a quiz. 1. Can I make multiple Google document submissions for an assignment. Yes, you can. This depends on the maximum no. of submissions setting set by your instructor for that assignment. 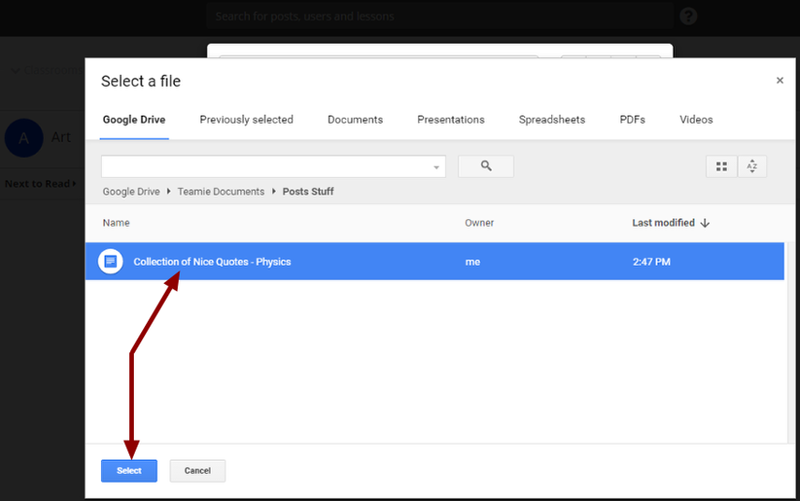 For example, if the assignment has 3 maximum submissions and the student has made none, then you can make Google document submissions upto 3 times. So, Teamie keeps track of all 3 submissions you have made, and instructor can switch between the different attempts using the attempts drop-down in the top left corner of the learner's submission grading page. 2. Can I upload multiple files as a single submission by the student? Currently, Teamie allows you to only pick one file for submission. If you wish to submit multiple files, in a single attempt, then you can zip the files and upload as a single zip file. If you wish to upload multiple files as separate attempts, then you can repeat the process described above multiple times to make multiple submissions.